Many Members of Congress have become increasingly concerned about what can be done to address student bullying. Congressional interest is in response to high-profile incidents of bullying and their negative consequences, as well as to an increasing body of research documenting the detrimental effects of school bullying. 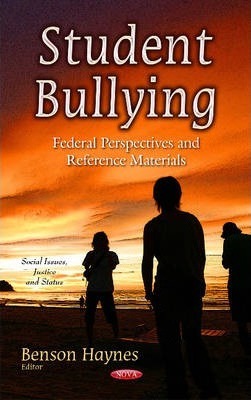 This book begins with working definitions of bullying and cyber-bullying that were developed by a federal interagency working group. It provides a brief overview of research on the prevalence and impact of bullying, and it reviews research on what can be done to reduce student bullying. The authors continue to discuss the federal and state laws providing protection of children from cyberstalking, cyberharassment, and cyberbullying and end the book focusing on the White House conference on bullying prevention. Preface; Student Bullying: Overview of Research, Federal Initiatives, & Legal Issues; Protection of Children Online: Federal & State Laws Addressing Cyberstalking, Cyberharassment, & Cyberbullying; White House Conference on Bullying Prevention; Index.